Our company works with tens of thousands of authorized service professionals. Each technician is extensively trained by the respective manufacturers to provide service on your products. Authorized technicians must complete annual and bi-annual continued education exams in addition to being well versed in manufacturer supplied update bulletins to ensure their level of expertise is as current as the new products which come to market. We urge our customers to provide feedback regarding their experiences which we later use to insure that the level of service we are expected to provide is exactly the level of service you receive. How do I arrange for service? Approval from Consumer Priority Service is required prior to the start of service. To initiate a claim please click here. Alternatively, you may call customer service at (800) 905-0443. Please have your original bill of sale and the plan available so our Customer Service representatives are able to quickly assist you. Do you cover the cost of shipping? You are responsible for the cost of shipping in the event that your item needs to be shipped. Do I get a loaner unit when my product is being serviced? We’re sorry, but we do not offer loaner units while your unit is being serviced. Depending on the type of coverage you own, an extended warranty begins at the conclusion of the shortest portion of the manufacturer’s warranty. If the manufacturer’s warranty was 90 day labor and 1 year parts, the extended warranty would begin on the 91st day and continue for the duration of the warranty period. All replacement, commercial and accidental plans begin on the date of purchase. We cover 100% parts and labor for covered repairs. When you purchase a Replacement Plan, your entire product is covered! In addition, some plans include accidental damage from handling (ADH) coverage for enhanced protection. Claims resulting from misuse, abuse or negligence are not covered. What does an accidental policy cover? If you have added Accidental Coverage to your plan, as indicated on your Warranty Card as well as your Online Account, this Plan shall cover unintentional damages as a result of: impact, liquid damage or unintentional physical damage. Accidental Coverage is an option for new, store-purchased items and protects against drops and spills. Accidental Coverage is typically offered as an option for MP3 Players, Laptops, GPS Devices, Cameras, and other portable electronics. Accidental Coverage does not cover intentional damages of any kind to the Covered Product or losses due to theft. Accidental Coverage does not cover willful damage, misuse, damage due to neglect, drops over 6 feet, fire damage, full immersion in water or salt water exposure. Accidental Coverage does not cover damage caused by the use of a product in a way the manufacturer never intended. Accidental Coverage also does not cover damage incurred by natural disasters (ie: hurricanes, tornadoes, earthquakes, fires…etc), or damage that is incurred by an animal or pet (ie: dog chewing). Coverage for this plan shall begin 30 days after the date of purchase of the covered product. Accidental Coverage must appear on the original bill of sale alongside the covered product and must be registered. Refer to the details of the warranty for the full list, but there are some notable exclusions to your coverage. We do not cover items that are dead on arrival, fail within the first 30 days or have a pre-existing condition. We do not cover accessories & consumer replaceable parts (ie: batteries, ink cartridges, lenses, cables & other consumables). Software: We do not cover software issues, including software for computers, cell phones…etc. Fraudulently misrepresented items are not covered. We do not cover stolen or lost products. To see what is covered and not covered under our accidental policy, go here for a visual representation. Please see the screenshots below to see where in your account you can upload a product invoice. It’s important to have an invoice on file for each warranty you have purchased. Step 1: Click on your Warranty # to access its options. Step 2: Click on the “Upload a File” button. 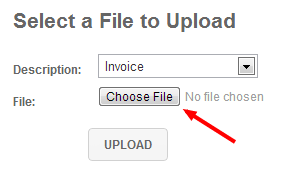 Step 3: Select your invoice file from your computer and click “Upload”. That’s it! You should see your uploaded files to the right of the page. Please see the screenshots below to see where in your account you can file a claim. Step 2: Click on the “File a Claim” button. Step 3: Fill out the form and submit your claim information. Done! Does my CPS Warranty cover the removal of my car stereo from the dashboard? Can I send my product to you while it has the manufacturer’s warranty on it? If the manufacturer’s warranty is still in effect for your product, you will be directed to the manufacturer to complete the required service. How many assets can I cover at once? The sky is the limit! The more assets you cover, the better the price. Check out our bundles for the best CYA deal. CYA will never, ever, force its customers to sign contracts. Cancel your monthly plan at any time, no harm, no foul. Bought a prepaid yearly plan? You can cancel this plan for a pro-rated refund for the unused portion of the coverage.